The Genelec 8330 Stereo SAM Kit is designed for mixing engineers who want accurate sound reproduction in a relatively compact design. This package provides two 8330A active 2-way monitors with 5" woofer, DSP crossovers, analog inputs, and digital inputs. Use it with the GLM 2.0 User Kit, which helps you digitally tune these monitors to your room, accounting for frequency issues and time-alignment problems. 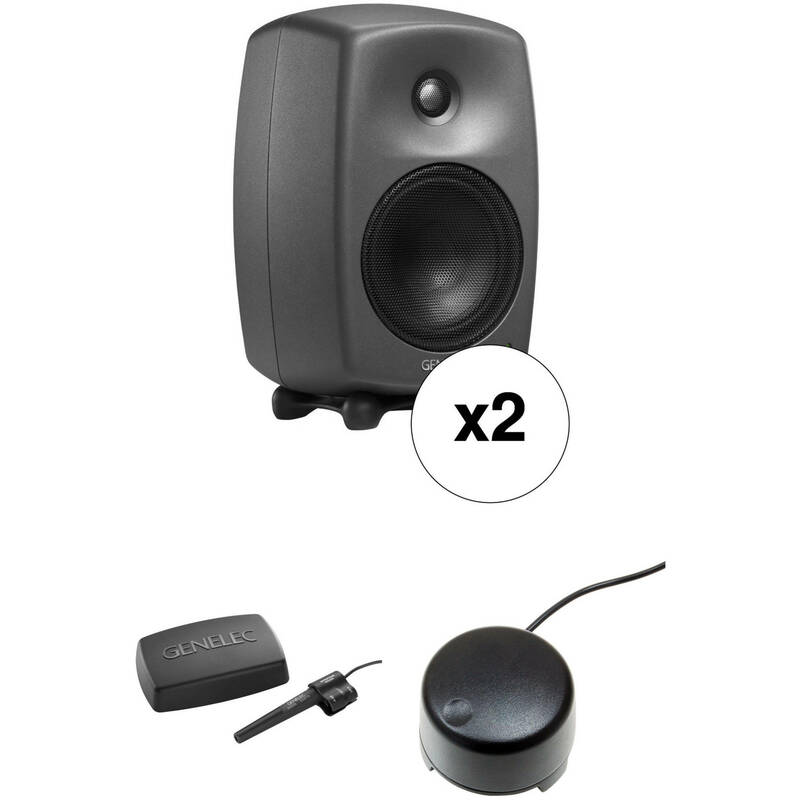 The Genelec 9310A, which also ships with this kit, is a hardwired volume control for both monitors and for precise command over your speaker's levels. The dark gray 8330A 100W 5" Active 2-Way DSP Monitor Speaker from Genelec is an advanced 2-way monitor speaker suitable for use in professional studios. The speaker has a Minimum Diffraction Enclosure that houses a 5" woofer and a 0.75" tweeter. A Directivity Control Waveguide works with the MDE enclosure to provide a flat frequency response, excellent imaging precision, and minimal listening fatigue. A flow-optimized bass-reflex port provides solid low frequency response without compression, distortion, or port noise. The bi-amplified design provides 100W of total output power for a strong, clear performance with exceptionally low distortion. The speaker features DSP crossover filters, magnetic shielding, and overload protection circuitry for smooth, reliable operation. Genelec Loudspeaker Manager software (sold separately) allows you to manage all of the speaker functions easily, such as level adjustment, distance delays, room EQ, and more. The speaker has both analog and digital inputs, plus a digital thru connector for flexibility. The included Iso-Pod base decouples the speaker from its mounting surface to eliminate coloration caused by vibrations and reflections. The speaker also has integrated rear support points for floor and wall stands, plus an M10 threaded mounting hole on the base. The GLM 2.0 User Kit from Genelec is an accessories kit designed for Genelec's GLM 2.0 networking system. It includes a GLM network adapter, a microphone with a holder, a USB cable, and a GLM network cable. The GLM 2.0 Loudspeaker Manager Software is available for download with the purchase of a GLM 2.0 User Kit. GLM 2.0 is a monitor control networking system that manages connectivity with up to 30 SAM studio monitors and subwoofers. The GLM software is compatible with Windows and Mac and features level adjustment, distance delays, and flexible room response compensation equalization with the AutoCal automated calibration system. All parameters and settings are stored in system setup files or saved in each individual monitor or subwoofer if the GLM network needs to be disconnected. The 9310A Volume Controller from Genelec provides wired volume control for all SAM studio monitors and subwoofers linked to the GLM 2.0 Network Adapter via the software volume fader. The controller connects to the GLM 2.0 interface using a built-in 3.5mm stereo male connector. Box Dimensions (LxWxH) 17.4 x 11.8 x 11.7"
Box Dimensions (LxWxH) 9.9 x 4.8 x 2.3"
Box Dimensions (LxWxH) 4.4 x 4.4 x 2.0"